Leighton Denny Smooth Your Sole Foot File makes is easy to remove thick, dry skin from the heel and ball of the foot helping you get the gorgeous feet you’re after. This Leighton Denny Foot File is light, easy to hold and easy to keep clean. Use as part of a weekly pedicure treatment or in the shower 2 or 3 times a week to stop build up. I was starting to have really bad cracked heels and this file really helped to file the rough areas away. Will definitely repurchase this again! I’ve used these Footfiles for years - they are brilliant - the best type I’ve ever used. This order was a gift for a friend. I’ve given to many friends in the past and they all love them. 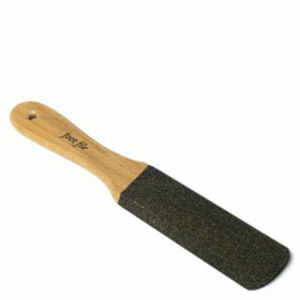 This foot file is great; it really works on very hard, cracked heels quickly and effectively. This is the best foot file you can buy - trust me I tried 'em all. Highly recommened. This Leighton Denny foot file sends my feet into foot heaven. It's easy to hold and use and I get beautifully soft smooth heels in an instant. I won't use any other product since finding this. It's design makes it easy to hold and packs away in the slimmest of spaces. Definitely my favourite "gadget"
I use this Foot File for a long time and it is very, very excellent. Just a Leighton Denny Product. I like this product so much that I have bought it as part of a birthday present for many of my friends. It really works and is very long-lasting. I do like this product and I will continue using it however I found neither side I used was strong/coarse enough to take away all of the dry skin on my feet. I would say it works 75% of the time and softens the foot well. I absolutely love Leighton Denny products and this hasn't changed my mind! With 3 baby boys I have less time to myself to get my usual mani/pedi or any beauty treatments. At least my feet can stay in good order! This product is great easy to use and is the Leighton Denny expected product. After buying this one would not buy anything else.